Just finishing up, will call in a few - let's do something fun tonight. This is maybe not funny to anyone but me. But to me, it is hilarious. 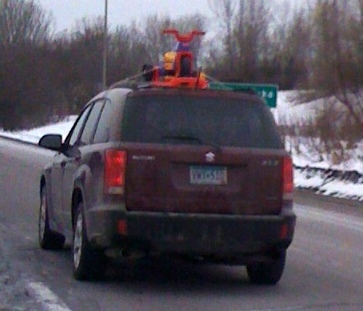 In other news, I saw this driving down the road the other day. Do you think that toddler trike was so large it couldn't fit into the enormous van? And so it was necessary to strap it to the top of the car???? I almost stopped the car to ask why it was up there. Almost.